Either generation can write a sweet letter to their "grand" using the heartfelt prompts in this journal. 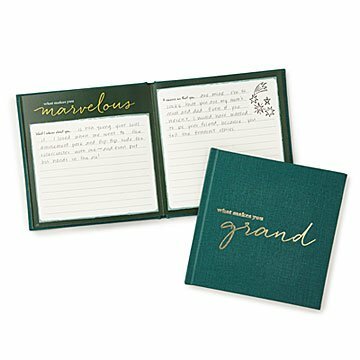 Grandparents and their grandchildren share a unique bond, and this keepsake journal lets either generation write a touching letter to their "grand" using heartfelt prompts. Tell them how they've made an impression ("My fondest memory of us together is…") and why they're inspiring ("You make a difference in my life by…") on the lined pages. In the "You & Me" section, write down all the things you have in common, and what makes you each unique. Complete with a dedication and sweet haiku in the beginning, the book makes a thoughtful gift they can pick up and read for years to come. Best for ages 12 to 112. Made in San Antonio, Texas. Copyright © 2018 UncommonGoods, LLC. 6.25" L x 6.25" W; 40 pgs. This gift made everybody happy! Gift that will keep on giving for years to come. A gift that will show the love between a grandparent and grandchild for eternity.